The Herald Star is the source for almost all of these articles, this archive is being kept to make sure we have them for the history of the restoration project. Thanks to the Herald Star for providing us great coverage! STEUBENVILLE - A Zanesville company has started to remove asbestos-covered pipes in the Grand Theater this week as part of a 10-year rehabilitation project. Lepi Enterprises erected scaffolding and was starting to remove the pipe work covered in asbestos for disposal at an approved landfill. Lepi was the sole company to bid on the project. The $49,748 contract is being paid through the Clean Ohio Revitalization Fund grant received by the city last year. Representatives from the Ohio Department of Development Services and the Ohio Environmental Protection Agency toured the theater earlier this summer. Scott Dressel, president of Grand Theater for the Performing Arts Restoration Committee, said the asbestos- covered pipes were part of the theater's old heating system. "The project should last about six weeks, and all of the asbestos will be completely removed from the building. I am very glad we were able to receive the state grant to do this project and appreciate the efforts by the city and the Jefferson County Regional Planning Commission," said Dressel. Steubenville Urban Projects Director Chris Petrossi said the total cost of the project is $129,000. After walking from the theater into the front lobby, Dressel said the seating and stage area will be completely sealed during the asbestos removal. "No one will be allowed in the theater until the work is done," stated Dressel. That means Dressel and his team of volunteers are now looking at exterior projects for the fall. "We have several possible work projects, but have not yet decided on what we will be doing outside," Dressel said. Earlier this year, the Grand board of directors chose Shaeffer & Madama of Wheeling as the official architectural firm for the restoration of the South Fourth Street structure. "Shaeffer & Madama, along with the engineering firm previously selected - Whitney Bailey Cox and Magnani of Pittsburgh - will be doing all the architectural and engineering work to meet the code requirements of the city of Steubenville and state of Ohio, as well as the design changes desired by the Grand Theater for the Performing Arts Restoration Project Design Committee," Dressel said. "Our board of directors took a lot of time researching and discussing the architectural firms. And, Dennis Madama of Shaeffer & Madama is very excited about this project. We have also had the interior of the building laser scanned by the All Point firm of Pittsburgh," said Dressel. "At this point, we anticipate starting the $1 million restoration of the front of the theater in the summer of 2014. And, we are now planning to create an historical memory lane concept on the stairway leading to the second and third ballroom areas as well as murals throughout those two rooms," Dressel explained. Dressel has been leading the grassroots efforts to preserve and restore the theater since 2010. The last remaining downtown theater was once in danger of falling victim to a wrecking ball after years of neglect and lack of repairs. Steubenville housing officials began to investigate the structural conditions after a neighboring property owner filed a complaint on Oct. 6, 2008. Since assuming ownership of the theater, Dressel has coordinated the sealing of the leaking roof, removal of the main floor auditorium seats and cleaning the interior of the building. Volunteers have restored the lobby of the theater with paint and new carpeting. "Sometimes we are too quick to tear down the old historical buildings because of their poor conditions. It will be nice to save a piece of Steubenville's history for a change. I have never lost a project once I started a restoration. I don't want to start now," Dressel stated. Visitors to the theater in 2010 saw broken seats, a water-soaked stage and falling plaster. But, Dressel said he could look past the aging interior and see a theater once again filled with movie and stage patrons and, "the glory of the past years." "When I stand on the stage I actually see the theater finished in my head. In my head it is all done. I do that all the time. When I work on my restoration projects I always envision and think about everything for a long time before I actually do anything because it is art, not just structure so you really have to think your way through," explained Dressel. Dressel has estimated the theater restoration project will last at least 10 years. STEUBENVILLE - The Grand Theater board of directors has chosen Shaeffer & Madama of Wheeling as the official architectural firm for the restoration of the Grand Theater on South Fourth Street. Scott Dressel, president of the board of directors, announced the firm had been picked following a six-month search. "Shaeffer & Madama, along with the engineering firm previously selected, Whitney Bailey Cox and Magnani of Pittsburgh, will be doing all the architectural and engineering work to meet all the code requirements of the city of Steubenville and state of Ohio, as well as the design changes desired by the Grand Theater for the Performing Arts Restoration Project Design Committee," Dressel said. "Our board of directors took a lot of time researching and discussing the architectural firms. And Dennis Madama of Shaeffer & Madama is very excited about this project," said Dressel. "We have also had the interior of the building laser scanned by the All Point firm of Pittsburgh. They are returning this week to finish their scanning of the exterior of the building, which will make it easier for the architects to start working on the front of the building," noted Dressel. "At this point we anticipate starting the $1 million restoration of the front of the theater in the summer of 2014. And we are now planning to create an historical memory lane concept on the stairway leading to the second and third ballroom areas as well as murals throughout those two rooms. I have compiled a list of 70 places in Steubenville that people like to reminisce about, including stores, ice cream shops, restaurants and bars. Once we have the list posted on Facebook, people will be able to vote on what mural they would like to see. And future managers of the theater will be able to change those murals 50 years from now to reflect the new history of Steubenville. We want to capture the history of Steubenville," explained Dressel. He has been leading the grassroots efforts to preserve and restore the theater since 2010. The last remaining downtown theater was in danger of falling victim to a wrecking ball of years of neglect and lack of repairs. Steubenville housing officials began to investigate the structural conditions after a neighboring property owner filed a complaint on Oct. 6, 2008. Since assuming ownership of the theater Dressel has coordinated the sealing of the leaking roof, removing the main floor auditorium seats and cleaning the interior of the building. Volunteers also have restored the lobby of the theater with paint and new carpeting. "Sometimes we are too quick to tear down the old historical buildings because of their poor conditions. It will be nice to save a piece of Steubenville's history for a change. I have never lost a project once I started a restoration. I don't want to start now," Dressel stated. The front of the building that houses the lobby was built in the 1880s to house a saloon and livery station. The theater was added in 1924 when the four Biggio brothers (Charles, Edward, Howard and William) leased the property, tore down the livery stables and built the auditorium for a theater. Visitors to the theater in 2010 saw broken seats, a water soaked stage and falling plaster. But Dressel said he could look past the aging interior and see a theater once again filled with movie and stage patrons and "the glory of the past years." "When I stand on the stage I actually see the theater finished in my head. In my head it is all done. I do that all the time. When I work on my restoration projects I always envision and think about everything for a long time before I actually do anything because it is art, not just a structure, so you really have to think your way through," explained Dressel. He has estimated the restoration project will last at least 10 years. Dressel and his group of volunteers have continued to make new discoveries in the theater and adjacent store buildings. When he climbed down wooden steps to a dirt floor basement below a vacant store building just south of the theater he found a brick room in the middle of the basement. "When I opened the wooden door I found about 100 wooden spindles and wood frame windows that appear to have been built during the Victorian era judging from the design," said Dressel. "The brick room is about 8 feet long, 6 feet wide and 6 feet tall. The inside ceiling is arched and entirely of brick. I have made some calls but so far no one knows what the room might have been used for," explained Dressel. According to Sanborn maps the building at 123 S. Fourth St. have been used as a saloon, restaurant and meat store at different times in the late 19th and early 20th centuries. In later years the store was home to a men's clothing store. Dressel said he plans to create a mini-movie theater in the former store. "We now have two women who are professional grant writers searching for funding opportunities. And anyone with an idea about a grant should contact us. We are also looking for a development director to lead our fundraising efforts as well as looking for donations," Dressel stated. Dr. Susanne Curn-Escobar of Steubenville is the newest member of the Grand Theater Restoration Project and chair of the effort to organize a performing arts museum as part of it. Early theaters in Steubenville are a part of her family history as her grandfather, the late William J. Curn Sr., brought the first nickelodeons to Steubenville and had owned and operated three. 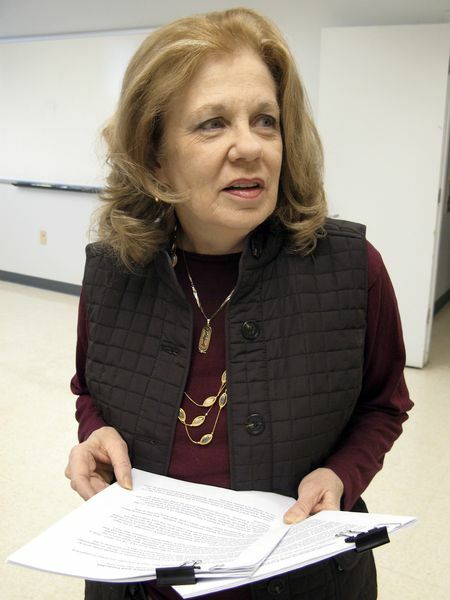 STEUBENVILLE - As the newest board member of the Grand Theater Restoration Project, Dr. Susanne Curn-Escobar of Steubenville finds it easy to put her heart into the effort, especially her role in getting the museum part of it off the ground. The long-term plan to transform the South Fourth Street theater into a performing arts center also includes a vision for a museum that will showcase Steubenville's theater and performing arts history. And that makes Curn-Escobar, chair of the museum project, a happy camper, given it's a part of her heritage. A retired surgeon, Curn-Escobar returned to Steubenville in 2008 to care for her mother, Virginia Curn. After her mother's death, Curn-Escobar began looking for a local project to get involved in and read about the movement to return the Grand Theater to its hey-day splendor. "I became very interested in their progress, and when I heard there was going to be a performing arts museum included, I couldn't wait to become involved as theaters happen to be part of my family history," Curn-Escobar said. "The Grand was always a favorite during my younger years, and I remain an avid movie fan," she added. When the overall theater project is done, it will be a performing arts center, according to Scott Dressel, president of the Grand Theater Restoration Project. "We will be able to have events on stage and utilize the dressing rooms, etc., for plays, concerts and other types of theater," he said in offering an overview of the potential of the finished work. We also will have the capability of showing movies. The two ballrooms will be finished as event space. At this time the idea under consideration is to have the ballroom walls themed after a variety of downtown stores, diners and places that people love to reminisce about." The museum, meanwhile, will be housed in the storefront just to the left of the lobby entrance, Dressel said. "It will concentrate on the theater and performing arts history of Steubenville," Dressel said. "We will as well cover other downtown history on the two ballroom floors which will be a part of the museum. Our plan is to have the museum open year-round to generate revenue to cover the costs of utilities and general operation," he said. "The museum is really there to display and capture the history that people would like to see saved to share with their children and grandchildren. So it's really up to the community what it contains," Dressel added. The invitation to become a member of the board and chair the museum project prompted Curn-Escobar to do some research. "I started to investigate the history of theater and the arts that existed in Steubenville's past and have been amazed with what I have been able to discover," she said. Her grandfather, for example, the late William J. Curn Sr., brought the first nickelodeons to Steubenville and had owned and operated three - the Rex, the Alvin and the Minerva before dissolving his nickelodeon business with the arrival of "the talkies," she said. The Rex was located at 517 Market St.; the Alvin at 349 Market St; and the Minerva at 110 S. Fourth St., she said of the addresses listed in the 1913 Steubenville Directory. "As described in the book, 'Father and his Town' by Wilma Baker, he had a huge Victrola horn mounted on the theater facade which played music to draw people into the theater," she said. "We have several photographs of his different theaters with their entrances decorated with large banners describing the movies being shown. Sometimes there were also mules outside, decorated with ribbons and feathers that towed wagons with even more banners that moved through town to attract interest," Curn-Escobar said. Joseph B. Doyle's "20th Century of Steubenville and Jefferson County," she said, "describes how from approximately 1812 to 1820, families moved to this area whose members made great artistic contributions to this city. Their descendants became known nationally and internationally in all aspects of the arts, and Steubenville artists traveled to Europe to study with the great painters and music teachers of the day." Among them was the Cole family, she said, that brought the first piano to town, "and people lined up and down the street to hear the music played. Another family's son, although primarily a painter, built several pipe organs from scratch, and one was used for church services in St. Paul's Episcopal Church," she said. As Curn-Escobar looked further, she discovered that Steubenville had a Philharmonic Orchestra during the 1800s and a thespian society "that performed in Bigelow's Stable located behind the United States Hotel, until the hotel was destroyed by fire in 1885. A member of the Cole family, a known artist, painted the scenery for the stage presentations," she said. "In 1873," Curn-Escobar continued, "a trio of Steubenville musicians, two of them vocalists, went to Europe to study. One of them, Mr. William MacDonald, with his wife, also a vocalist, brought their opera company to Steubenville for three Grand Opera performances and gave a concert for the Stanton Monument Association." She said river showboats with their floating theaters stopped here to give performances, and local theaters with vaudeville shows became very popular local entertainment. "We have also been told that because Pennsylvania was a 'blue' state and stage presentations were prohibited there on Sundays, many famous artists and bands that were performing in Pittsburgh would come here and give shows on Sundays which were quite a treat for the residents of this area," Curn-Escobar said. It all adds up to great potential for a performing arts museum. "Steubenville, from its very early years, was a center for the arts and has quite a history," Curn-Escobar said. "We hope that our museum will be able to showcase detailed accounts of these times and include data and hopefully, souvenirs, from our performing arts' past. Should anyone have any memorabilia or information of Steubenville's artistic story, I hope they will contact us as we hope to include as much data and examples as possible," she said. The overall restoration effort of the Grand Theater was launched on May 24, 2010, according to Dressel in offering a look at what has unfolded so far. "It took until July 2011 to raise the funds for the roof, and the main roof was then completed. At Christmas 2011, we were donated the Annex Building to the south of the Grand," Dressel said, noting money was raised to have that roof finished by July 2012. More than 200 volunteers spent more than 3,000 hours cleaning all the rubbish from old businesses out of the Grand. "The lobby was cleaned up and mold abated in the fall of 2011, and the lobby was mostly completed by March 2012," Dressel said. Heat was installed in the office room, lobby and museum room spaces in the fall of 2012, he added. "Thus far we have raised about $300,000 in donations and grants," Dressel said. "This includes $124,000 for the abatement project from the Ohio Clean Funds that is about to be started; $30,000 from the Ohio Governor's Office of Appalachia which was for the roof; $5,000 from the JC Williams Trust for the lobby restoration; and $10,000 from the Charles M. and Thelma M. Pugliese Charitable Trust for matching funds for the Ohio Clean Funds Abatement Grant, and lots of individual donations and sponsorships for events," he said. "As always we are in need of donations to continue work and are looking for major sponsors who would be interested in naming the theater or various parts after themselves, a loved one or a business," he said. "I would appreciate anyone with contacts in the oil and gas industry who might be interested in naming sponsorships to give me a call or let me know who to contact," he said. The engineering and architectural design work constitutes the current concentration. "We are concentrating on completing the engineering and architectural work for the restoration," Dressel said. "We are looking for someone to fund/sponsor that. We are, as always, working on fundraising and grant writing to fund the overall restoration," he added. Although events are not finalized, 2013 plans are for something to be held the weekend of the Hometown Celebration in June; the Christmas fashion show in the fall; and an open house in December again on the day of Steubenville's Christmas parade. "We may have something else coming up this winter/spring that is still being finalized," said Dressel. As for the museum part of the project, Curn-Escobar said it is in the planning and organizing phase. "We are preparing our fundraising toward that goal," she said. "We are anxious to tell Steubenville's performing art history and who knows, we may even arrange for a few Victrola horns, banners and donkeys of our own to announce our grand opening," she speculated. Donations can be made to the Grand Theater project by contacting Dressel at (740) 632-2899. The project office address is 506 N. Fourth St., Steubenville, OH 43952. Information also is available on the website and Facebook fan page. It was fun to be in downtown Steubenville on Saturday, Dec. 8, to watch a Christmas parade that was well attended and to stop by the Grand Theater, the site of an open house that offered visitors a chance to see the restored lobby and the status of the theater itself. Several hundred people attended the open house, according to Scott Dressel, president of the Grand Theater Restoration Project. An effort to restore the theater at 121 S. Fourth St., Steubenville, was launched about three years ago. "The comments were positive and supportive, with most everyone wanting to know when we will be open. Of course that depends entirely on donations to get us from where we are to completion," said Dressel, who was pretty busy during that three-hour open house period taking people on tours of the theater area beyond the lobby. "It was great fun talking to everyone who stopped by and discussing the restoration. Our next step will be completion of the engineering and architectural work," Dressel said. The event included representatives of the Grand Theater Restoration Project Board, including Donna Keagler and Jan Glaub Rainbolt, selling "Friend of the Grand" annual memberships which are $25 for an individual or $50 for a family. There also are business memberships available - $100 for businesses with fewer than 50 employees and $1,000 for a corporate one for 50 or more employees. Board members also were selling Grand Theater pins that double as a Christmas ornament for $10. I have one of them on my Christmas tree, incidentally. Susanne Curn-Escobar also was on hand and is the board's newest member. "She will be taking on the museum portion of the restoration - everything from fundraising to restoration and the eventual collection and display of the history of entertainment in Steubenville and downtown generally," Dressel said. The lobby was busy with visitors when I arrived, greeted initially by board member Francesca Carinci and Rachel Roggensack, one of two "elves" from the Franciscan University of Steubenville on duty as door openers. The lobby looked great, decked out for the holiday with a donated Christmas tree and poinsettias from St. Peter's Catholic Woman's Club. A festive touch. By the way, Donald Springer was the winner of a $100 Visa gift card as part of a photo contest open to anyone who submitted a photo of themselves in front of the lobby doors with the lobby Christmas tree lights on. The photos were to be posted to the Grand Theater Restoration Project's Facebook page for the random drawing conducted at the open house. As I left the open house to head out and find a spot to watch the parade, I ran into co-worker and former Jefferson Union High School classmate Pat Mayers Scheel, who was waiting with her mother, Barbara Mayers, to watch the parade. I mentioned that I'd just come from the Grand Theater, and Barbara, who was eager to visit there after the parade, shared a little story about what makes that place something special to her. When she was a teenager, the former Barbara Curry - she grew up on Pleasant Heights - had her first date with her future husband, the late David Mayers, at the Grand Theater. They met in 1947 and went to see "The Egg and I," starring Fred MacMurray and Claudette Colbert. The two were married for 60 years before his death in March 2011. "It was beautiful," Barbara said of the Grand. "We always sat in the balcony, and they used to have giveaways on certain days when you would go and they would be on the stage and give dishes away and things like that. I remember that real well." A promotional flyer notes the restoration goal is that the theater be transformed into "the Grand Event Center and Performing Arts and History Museum to be completed in 11 years." If you'd like information about the restoration project or want to get involved in seeing the theater brought back to life, contact Dressel at (740) 632-2899. 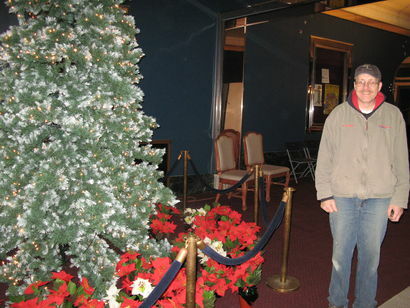 STEUBENVILLE - Visitors to downtown Steubenville on Dec. 8 can expect to have a "grand" time on two fronts - not only at Steubenville's Christmas Parade, which is set to begin at noon, but also by being able to see the restored lobby of the Grand Theater from 11 a.m. to 2 p.m.
"This will be the first time since we started the project that we'll have the theater open to the public for an actual event," said Scott Dressel, president of the Grand Theater Restoration Project. The lobby open house is free of charge and is sponsored by the board members of the theater project, which roughly three years ago launched the effort to rejuvenate the theater located at 121 S. Fourth St. But those interested in seeing more of the theater's renovation status can take the tour opportunity an additional step. "We will also offer tours for $5 per person down to the stage on the main theater floor, so you can see all the work that has been done and how much remains to be completed," Dressel said. The open house marks a first in many years. The last time anyone set foot in the lobby was 1979, the last year it was actually open for a film," Dressel said. "Three years ago, roughly, the lobby was filled from floor to ceilig with essentially antiques and collectibles and used furniture for the used furniture store that was here, and I mean floor to ceiling," Dressel said. "You actually couldn't get through it. For the first year, we actually went up the stairs, through the ballroom and back down from the mezzanine to get in the theater because we couldn't go through this space," he said, "so we cleaned that out on our first volunteer weekend. We had four weekends that year with about 120 volunteers, and we hauled many, many, many tons of rubbish out of here." Work in the lobby combined painting, carpeting and cleaning of the six poster frames all lined with new velvet and anticipated to have new lighting. The lobby has heating but no bathrooms, which is a project hoped to be completed by next fall. "We have a variety of things donated in the poster frames now," Dressel added. The lobby also sports a festive holiday touch with a large Christmas tree and poinsettias donated by the women's group at St. Peter's Catholic Church. Dressel is excited about the open house. "It's cool because I think this will help people visualize what we've done and where we can go and especially if you take a look at what's been done in so many other communities with their historic theaters, this is easily doable and can be done in a reasonable amount of time with the right support, so this is our way of getting people involved and giving them a chance to see up close and personal what exactly has happened and what still needs to take place," Dressel said. "In celebration of our first open house we are having a photo contest to win a $100 Visa gift card," Dressel said. People wanting to enter the drawing are to have a photo of themselves taken in front of the lobby doors with the lobby Christmas tree lights on in the background and post it on the Grand's Facebook Fan Page. The Christmas tree lights are on daily from 6 a.m. to 9 a.m. and from 4 p.m. to 10 p.m. The contest is under way through midnight on Dec. 7. There is a limit of one entry per person or family. The winning photo will be drawn at the open house. The winner need not be present. 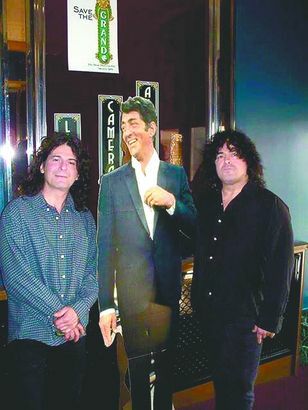 The open house also will be occasion for people to take free photos of themselves with cutouts of Dean Martin, Frank Sinatra and Elvis Presley. Visitors also will have a chance to become a "Friend of the Grand" with annual memberships available and providing a free tour. They are $25 for an individual; $50 for a family; $100 for a business with fewer than 50 employees; and $1,000 for a corporate level membership for more than 50 employees. Memberships are tax-deductible with 20 percent going to the Grand Endowment Fund and 80 percent to the current restoration phase of the project. Also on sale are Grand Theater pins that double as a Christmas ornament. They are $10. At the board's Dec. 6 meeting, an announcement will be made concerning a new board member who will specifically work on the museum part of the theater project in the room next door, from fundraisers to collecting items for it, according to Dressel. For information, call (740) 632-2899. A "Grand Night for Holiday Fashion" held Nov. 17 at the Center of Music and Art in Wintersville raised more than $7,000 and was hailed successful as the second-annual fashion show, silent auction and such looked to generate funds to continue the work of the Grand Theater Restoration Project. There were a number of men, women and children modeling some beautiful fashions from Macy's, including yours truly, with Carrie Porter, Macy's sales manager, getting everyone lined up and ready to show off some great looks. She and the always-styling Francesca Carinci, an event committee member, introduced everyone to the audience and gave a little description of the outfits. But even before that, a crew of four makeup artists wielded their magic with Elizabeth Arden products to make us all look our best. For me, this was the first time I've ever had my makeup done, so to speak, and I went to the event early, "naked faced" as ordered. As I left the house feeling weird because of that, my son commented in his innocent yet sincere kind of way, "Mom, you look like you always do." He meant that as a reassurance, but I had to laugh. It was another good-time event I was happy to be a part of, and it was fun to see what everyone was wearing. I can't remember all the outfits but some stuck with me. Among the local models were Billy and Nikki Petrella; Gloria Popp always in black; Patricia Fletcher in this really great chartreuse coat; Deena Riley in cobalt blue; Steubenville Mayor Domenick Mucci; Steubenville City Manager Cathy Davison and her son John; Jennifer Cesta; first-time model Susan Adams; Judge David Scarpone and his daughter Zoe; Kathy Musso; Ame Taggart; Natalie Herbick, WTOV 9 anchor; Michelle Miller; Melanie Van Nuys; Robbie Martin; sisters Olivia, Victoria and Cecilla Shepherd; Kris and Christina Haught and children Xander and Brady; Edie Boyde; and Kay Sedgmer and her daughter Elisabeth Bittinger with children Hunter, Hayden and Hensley. The restoration project got two shots in the arm, one a $1,000 check from the Upper Ohio Valley Opera Guild, presented by Barb Wilinski, its treasurer, and the other a $1,000 check from WTOV 9, presented by Herbick. The event was sponsored by Macy's, the Center of Music and Art, the Herald-Star, Team Automotive Group, WTOV 9, the Women's Club of Steubenville, Nelson Fine Arts & Crafts, Two Brothers Dry Cleaners and Froehlich's Classic Corner. "This event will be helping us reach our match requirement for the Ohio Clean Funds Grant to complete the cleanout of the Grand. Funds will also be used to pay our engineering firm," said Scott Dressel, president of the board of directors of the Grand Theater Restoration Project, in a preview story about this event. In addition to Dressel, the event committee, included Carinci, Jan Glaub Rainbolt, Mark Nelson, Greg Froehlich, Tim McCoy, Ed Stanislaw, Beth Wood, Tony Corella and Donna Keagler along with assistance from board and event sponsors. 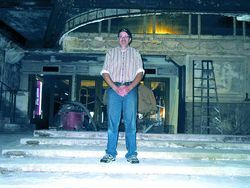 STEUBENVILLE - Scott Dressel has met the ideal structural engineer for the next restoration project at the Grand Theater. "We had an engineer from WBCM Engineers of Baltimore arrive at the theater last week. He was early, which was nice. And he spent all day in every corner of the theater, crawling through the attic, taking a great number of photos and checking the structural aspects of the building," Dressel, president of the Grand Theater Restoration Campaign, told his board of directors Thursday. "The firm is now preparing a formal proposal for us. And the nice thing is the firm has done a theater restoration before so they have experience in this work," continued Dressel. And one of his most encouraging comments was he thought the theater looked like a construction site and not a deteriorating theater," he added. Dressel said the engineer's study has cleared the way for an open house at the theater from 11 a.m. until 2 p.m. on Dec. 8, which is the day of the Steubenville Christmas parade. "We will allow visitors into the theater lobby and will also be able to conduct a tour to the theater stage for $5. We will be selling Grand Theater memberships for $25 that will allow for a free tour on that day or other days. And we plan on having the Franciscan University of Steubenville Students in Free Enterprise helping us with the tours," said Dressel. ;The parade is a good opportunity for some serious public relations for the theater. We hope to bring visitors in to see the theater and to gain their support for our future major projects," Dressel said. "We will be decorating the theater lobby in a Christmas theme prior to the Dec. 8 open house," remarked board member Francesca Carinci. "Our fundraising goal for next year is $1 million because we are now looking at several major projects next year. I have been though the theater this week as we experienced all of the rain and the building has remained very dry," he noted. Dressel also said Sane Technology will be laser scanning the theater during the next few weeks. "The file of data will be given to our engineering firm and architect for their future work. And it will also allow us to take a virtual tour of the theater through computer programs. This company is very enthusiastic about this project, and it will provide exact measurements of the theater. Dressel announced a Grand Night for Holiday Fashion, a fundraiser for the theater, is set for Nov. 17 at the Center of Music and Art in Wintersville. STEUBENVILLE - Scott Dressel has crawled through ceilings, hauled trash, painted walls and pleaded for financial donations and volunteers. But on Thursday, the president of the Grand Theater Restoration Project sat down for a board of directors meeting in the refurbished lobby of the 87-year-old building on Fourth Street that was once home to live stage shows and countless hours of movies. It was the first official event in the building since Dressel and the volunteers he enlisted began their efforts to save the former theater and restore it to its past glory. "We are starting our third year of restoration, and at this point I am looking at another nine years before the entire project is completed. But I am satisfied. We have come a long way in two years," Dressel said. "I don't get discouraged from all of the work. Yes, there are days when I am tired. But we have accomplished a lot in the past two years and look forward to the restoration work ahead of us," Dressel added. The completed work list includes a new roof that stopped the rain from leaking into the theater section of the building, the donation of an adjacent building that will be used for a museum and mini-theater and the removal of all of the first floor seats. "The smell in here left after the building was sealed and the seats were taken out. That was a big thing. We have had probably 200 volunteers at different times working to clean out the loose plaster and debris left in here. Now the theater is wide open and ready for the restoration work," explained Dressel. "And another big step for us will be significant fundraisng. We did obtain a $96,000 Clean Ohio Revitalization Fund grant to be used for the removal of the small amount of asbestos in the building. And we continue to seek grants and funds from different organizations," Dressel said. "We will also be completing the architectural drawings, and we continue to conduct engineering reviews of the building to make sure it will be ready for what we want to do in here," noted Dressel. Dressel said he is planning to gain input from the Franciscan University of Steubenville drama department. "We want to make sure the stage is right for performances in the future," he said. "And we are looking at new seats. But that will be the last project in the restoration. I can't wait to put the new seats in here. It's like looking at new furniture. It's fun to buy new furniture. but you have to wait to bring it home," Dressel said. "I am looking for board members who may want to do some volunteer work here. We need to do some weeding in front and the back of the building. We are also going to clean out the places in front of the theater where we can plant flowers. And I have two doors at the back of the building that need painting. And if anyone wants to take over decorating the display windows out, front please let me know," Dressel told the board. And as his board of directors excitedly talked about plans for the future, Dressel sat back and smiled. "I love these people. They have the same excitement for this project that I do," Dressel stated. Columbus, Ohio - Today, the Clean Ohio Council approved more than $19 million in Clean Ohio Revitalization Fund grants for 11 brownfield clean-up projects throughout the state, which are expected to create and retain nearly 900 jobs. The funding, approved at a Clean Ohio Council Round 12 awards meeting, will allow for the reuse of commercial and industrial properties that are currently underutilized. The grants are contingent upon State Controlling Board approval. "The communities receiving Clean Ohio Funds are taking the important first step to redevelopment – ensuring sites are safe and ready for growth," said Christiane Schmenk, Director of the Ohio Department of Development. "These investments will not only assist in finding new uses for old and underused properties, but also support vital job creation efforts around the state"
The Clean Ohio Revitalization Fund is a competitive statewide program that provides grants of up to $3 million to acquire property, demolish structures, conduct environmental cleanup, and improve infrastructure. Since its inception, 150 Clean Ohio Revitalization Fund projects have been awarded more than $295 million, leveraging $2.5 billion in private sector investment, and creating and retaining more than 12,500 jobs. City of Campbell (Mahoning County) – will receive $1.9 million for demolition and remediation work on property northwest of the Walton Avenue Bridge over the Mahoning River. Sherman International Corporation plans to develop an on-site industrial facility, Sherman Metals Technologies, LLC. The company will supply thin gauge steel in support of the construction, automobile, white goods, and HVAC industries. The project is expected to create 300 jobs. The funds will be used to remediate impacted soils, remove asbestos and general waste, and demolish existing buildings. City of Cleveland (Cuyahoga County) – will receive $1.3 million to conduct demolition and remediation activities at the Former Van Dorn Property at 2700 East 79th Street. The development partner, Orlando Baking Company, seeks to expand its existing operations onto the property. The project is expected to create 15 jobs and retain 40 positions. The funds will be used to remediate impacted soils, remove asbestos, and demolish the existing buildings. City of Dayton (Montgomery County) – will receive $3 million to conduct demolition and remediation activities at the former General Motors Corporation facility at 2701 Home Avenue. The National Park Service has been authorized by the U.S. Congress to purchase and restore the historic buildings to become part of the Dayton Aviation Heritage National Historic Park. Other areas of the property will be used for the expansion of manufacturing operations of adjacent companies. The project is expected to create 55 jobs and retain 22 positions. The funds will be used to remediate impacted soils, remove asbestos and general waste, as well as demolish existing buildings. City of Fostoria (Seneca County) – will receive $1.1 million to conduct remediation efforts at 901 South US 23. The owner and development partner, Industrial Asset Recycling Land Fostoria, LLC, plans to remediate and develop the site into an industrial/technology park. The existing 320,000-square-foot manufacturing facility could be subdivided into smaller spaces for multiple occupants. The funds will be used to remediate impacted soils and remove asbestos. Franklin County – will receive $3 million to conduct remediation activities at the corner of Dublin Road and Grandview Avenue in Grandview Heights and the City of Columbus. Upon remediation, the development partner, Wagenbrenner Development, Inc., plans to redevelop the land into 265,000 square feet of retail and office space and 200 residential units. The project is expected to create two jobs and retain one position. The funds will be used to remediate impacted soils and for asbestos abatement. City of Kent (Portage County) – will receive $1.1 million to conduct remediation at 627 Lake Street. The City of Kent is partnering with J&E Development Corporation, which plans to take ownership once remediation is complete. Two companies have committed to moving into the facility once it's complete. The project is expected to create 170 jobs and leverage $8.5 million of investment for building renovations and new machinery. The funds will be used to remediate impacted soils, remove general waste, and for asbestos abatement. City of Mt. Vernon (Knox County) – will receive $1.7 million to conduct demolition and remediation activities at the former American National Can Company at 201 Madison Street. A portion of the property is reserved for parkland and will consist of a bike path connected to the city's trail system and Riverside Park. The funds will be used to remediate impacted soils and demolish two well houses on the property. City of Sandusky (Erie County) – will receive $950,608 to conduct demolition and remediation activities at the former Sandusky Cabinets plant at 513 East Washington Street. Upon remediation, the city plans to utilize the property as a mixed-use development site including commercial and residential usage. The redevelopment of the property aligns with the city's five-year strategic plan. The funds will be used to remediate impacted soils and demolish the existing building. City of Steubenville (Jefferson County) – will receive $96,700 to conduct remediation activities at the former Grand Theater at 115 South 4th Street. Upon remediation, the building will be restored to its original performing arts and movie theater purpose. The building will also include the Performing Arts and Steubenville History Museum and a Dean Martin Museum. The project is expected to create two jobs. The funds will be used for asbestos abatement. City of Twinsburg (Summit County) – will receive $3 million to conduct demolition and remediation activities at the former Chrysler stamping plant at 2000 East Aurora Road. The current owner and development partners, Twinsburg Industrial Properties, LLC and Twinsburg Industrial Properties I, LLC, purchased the site in 2011 and conducted demolition of the onsite buildings. Development plans include construction of a 135,000-square-foot facility for Performance Food Group to expand its business operations. The project is expected to create 10 jobs and retain 50 positions. The funds will be used to remediate impacted soils, asbestos abatement and general waste removal, and demolition of the former structure foundations. City of Xenia (Greene County) – will receive $2.8 million to conduct remediation work at 690 Home Avenue. The property, originally developed to house orphans and widows from the Civil War, will be used as educational facilities, offices, conference and event space, and athletic facilities. The project is expected to create 50 jobs and retain 162 positions. The funds will be used for asbestos abatement, to remediate impacted soils, improve infrastructure, and demolish existing buildings. "A Grand Night in Las Vegas" is hoped to be a grand night in Steubenville for the Grand. And "thank you, thank you, thank you very much" is what event organizers hope to be saying afterwards to public response making this fundraiser a big success. This is an evening that will combine live entertainment, food, giveaways and gambling - an evening that chairman Francesca Carinci of the Grand Theater Restoration Project predicts will be "one of the most extravagant concerts that I believe we've had in this city in recent history." "A Grand Night in Las Vegas" will be held April 14 at Froehlich's Classic Corner at Fifth and Washington streets, Steubenville, with doors opening at 7 p.m. and five back-to-back shows in addition to "Las Vegas gambling" - black jack, roulette, craps and poker - going on throughout the evening that extends to 1 a.m.
Shane Patterson, an Elvis impersonator from Caesars Palace in Las Vegas, will perform two shows, each with a completely different playlist of songs and both with "his Vegas showgirl" Julie, who'll be "packing her feathers and finery." 11 p.m., Elvis and his Vegas showgirl. "There are two Elvis shows so if you can't be there for the early show, come for the late show at 11 p.m. This event will be going on until well after midnight," notes a publicity e-mail sent by Scott Dressel, president of the Grand Theater Restoration Project. 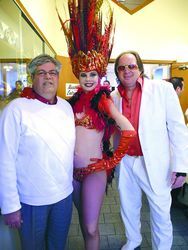 In a recent interview, Carinci and Billy Petrella, a member of the event committee along with Donna Keagler and Dressel, explained that there will be a cigar bar on the patio, and "We are having real Las Vegas gambling, and it's for money, not prizes," said Petrella. There will be professional male and female dealers courtesy of the Bikini Bar in Chester, Carinci added. "We're trying to push the card with this event," Carinci said. "This is going to be a spectacular event, over the top, something we're bringing to Steubenville because people always say there's no entertainment here, and this is probably one of the biggest events we've ever had downtown," Carinci said. Carinci said the showgirl is bringing her Vegas stage costume, head dress and all. "That in itself will be cool to see," she said. Patrons can have their photos taken with Elvis for a donation, and there will be a keepsake CD of candid photos available for a $20 donation, courtesy of Kristy Seditz. Money from pre-sales of it will benefit the Grand also. All those attending will be eligible for free giveaways. "It's going to be cool stuff," said Carinci of a Marilyn Monroe tote bag "full of Marilyn stuff," including a robe with her face embroidered on the back, and also a Dean Martin bag. "There will be giveaways through the night of free Las Vegas type things," she said. General admission tickets are $50, which includes all five shows, food and access to the gambling tables. In addition, there are about 25 VIP tickets for $150 each, which include all of the above plus front row seating for the shows, beverages, complimentary champagne at the shows and access to the high rollers room on the lower level. Tickets are available in advance at several locations, including Two Brothers Dry Cleaners, Froehlich's Classic Corner, Tri State Financial, Carinci's Law Office and Village Sleep Center in Steubenville and the Center of Music and Art in Wintersville. For information, call (740) 284-8008. Carinci said the Elvis impersonator and showgirl heard about the Grand Theater restoration project through a Facebook link, "and they were interested in this." "They are super excited about coming for this," Petrella added. "They think the project is wonderful, and they want to see the Grand Theater," Carinci said. "They are very big theater people, and somehow they got a link about this." Proceeds from this fundraiser are earmarked for plumbing for the theater, because in order to have an event there, functional restrooms are a must. "That's why we need to get plumbing," Petrella said. The lobby restoration is finished, complete with crown molding, paint and carpeting. "The lobby is gorgeous," Carinci said. "The furnace and gas line are done, and everything we've set out to do, we've done," she added. "We have come amazingly far," she said. "The lobby is done, and it looks beautiful." Petrella said roof work is about 75 percent completed on the adjoining building recently donated. "A lot of people have questioned why we took on a second building. The reason why is it has an elevator," Carinci said. The two said repairing the roof is by far cheaper than the expense of an elevator and digging an elevator shaft. Having an elevator is essential to the project moving forward. While progress is being made, a restoration effort takes time and money, according to the two. "Restoration is preserving a part of the history of this town," Carinci said. "We're preserving a part of our heritage." STEUBENVILLE - When he saw the possibility of having the last of Steubenville's theaters wiped from the city's landscape two years ago, Scott Dressel reached out to the community to "Save the Grand." Built in 1925 by the Biggio family, the Grand Theater was a venue for stage productions and films. It was under the ownership of a New York-based company when it closed in 1979 and was being used primarily for storage. The structure had fallen into a state of extreme disrepair since its closing, and the city wanted it razed or repaired. Dressel gained an appreciation for restoration early in life while working on a family farm in his home state of Minnesota. He grew up in a home that his father rebuilt and believes architecture is a core feature of history that should be preserved. Since relocating to Steubenville in 1996, Dressel has been involved in the restoration of numerous homes on Historic North Fourth Street. When he heard about the city's plans for the Grand Theater, Dressel emailed a number of Steubenville residents to gauge their interest in preserving the structure. He said the response among those queried showed a desire to restore the theater, and he formed a board of directors for the project. But the overall response from the majority of the community when work began was a conflicting one. Dressel said prolonged disappointment had developed in the downtown area. Steubenville residents had grown skeptical of downtown's redeemability and negative energy surrounded any efforts to do so. 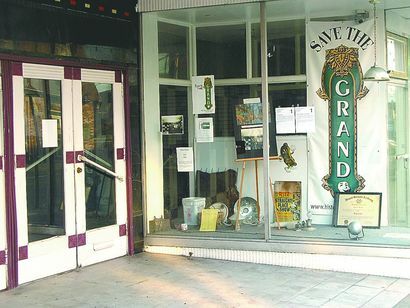 Public opinion slowly shifted, however, and the campaign to "Save the Grand" began to build momentum. Dressel said Steubenville residents quit asking why save the theater and began asking when it would be opened. The restoration process will be expensive and lengthy, costing around $6 million and taking about 15 years, according to Dressel. All the funds are coming through donations, and an abundance of volunteers have dedicated their time to the project. Dressel said a group of Franciscan University students recently spent their spring break cleaning up inside the theater. In fact, he added, about 75 percent of the volunteers were never inside the Grand Theatre while it was operational. "People just want to see downtown improved," he said of the volunteer effort. "Downtown Steubenville is interesting and unique; keeping it vibrant is important to putting a good face on Jefferson County. Losing the Grand would have been a huge blow to the redevelopment (of downtown), because you don't have an entertainment focal point." The new roof was completed last summer, and volunteers spent the fall removing trash and debris from the theater area. Work is now being performed on the front facade, while the lobby and office are almost complete. After it is restored, operating the Grand Theater would be relatively simple, Dressel said. He said the initial goal is to hold events monthly, at least, and eventually every weekend. The structure's ballrooms can also host events such as receptions and meetings. A museum displaying the city's history will be open daily, with the goal of ticket revenue paying for the building's utilities. STEUBENVILLE - The lobby of the Grand Theater was alive recently as children laughed and enjoyed pretending to be ready to watch a movie at the 87-year-old theater. The main seating area of the theater is still a long way from showing movies again. But the lobby has been restored to an original look with the painting completed and new carpeting now in place. "I just wish Bill Croskey was here to see what the lobby looks like. Bill was a strong supporter of our efforts to restore the theater and to preserve an important part of Steubenville history. He donated the lobby carpeting. And we will use the leftover carpeting for the adjacent office space," explained Scott Dressel, chairman of the Steubenville Historic Landmarks Commission. "We had several of Bill's relatives come down for a dedication ceremony and they enjoyed walking in the lobby and looking through the glass doors into the theater," said Dressel. Once the office space is completed and Dressel obtains an occupancy permit, he is planning to hold events in the lobby that will allow other visitors to watch work progress in the theater seating area. "Our current activities include having structural engineers come in to help evaluate and design what we need to modify for the mezzanine, balcony and all the roof trusses to ensure they meet current code and load requirements. Steubenville architect Les Zapor is working on the architectural drawings for us. And of course we need additional funding to continue that work," said Dressel. "It is encouraging to see a refurbished lobby area. I can remember walking in here when we started this project.The lobby certainly does look nice compared to a year ago," noted Dressel. "Our next fundraiser will be a Grand Night at Las Vegas from 7 p.m. until 1 a.m. on April 14 at Froehlich's Classic Corner. We have an Elvis Tribute Singer from Caesar's Palace in Vegas and an appearance from the Rat Pack.We are recreating a Las Vegas Casino in Steubenville. There will be gambling, shows, cigar bar and food," said Dressel. 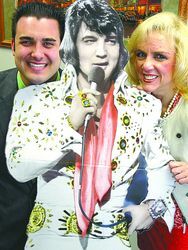 "The show is from 8 p.m. to midnight and will includes the Elvis Tribute performer who will perform two shows. Also performing will be the Dean Martin, Cher and Frank Sinatra Tribute performers," said Dressel. He added tickets are available by calling (740) 284-8008. STEUBENVILLE - The city's Urban Projects Office will proceed with applications to the Clean Ohio Revitalization Fund in order to perform asbestos abatement at the Grand Theater and the former LaBelle View nursing home. A required public hearing was held Monday afternoon by the Urban Projects Office to answer questions. "Both properties are very much needed in the community," said Urban Projects Director Chris Petrossi. David Kreeger, project manager of TRC Solutions of Gahanna, said his consulting firm has prepared the environmental assessment and cleanup plans for the theater on South Fourth Street and the former elementary school and nursing home on Maryland Avenue. "We are now applying for $90,000 for the cleanup and remediation work at the Grand Theater and $360,000 for the work at the former nursing home," said Kreeger. "We did a site walk through the theater and looked for anything that could be an environmental concern. The theater is part of an effort by the Grand Theater Restoration Project to revitalize the theater as a mixed use theater," said Kreeger. "The LaBelle View nursing home was recently used as an unlicensed paint ball business. It is an old building and is in pretty rough shape. A developer is looking at demolishing the building and doing site prep work in order to build a 40-unit low-income housing development for seniors 55 years of age and older," explained Kreeger. "The building is in such poor condition with asbestos, mechanical and maybe structural issues we feel it would be more cost effective to demolish the building and fill in the basement with appropriate material and prepare the site for future use," noted Kreeger. The former nursing home is currently owned by the nearby Tower of Power Church. Petrossi said church officials have been cooperating with the city and he is hopeful that cooperation will continue. According to the grant application, the property is currently unoccupied and does not generate any revenue through property taxes. "The property would be redeveloped and will qualify for existing tax incentives," reported Kreeger. The application indicates the redevelopment of the former nursing home property as housing for low-income families will bring immediate community benefit through access to safe, affordable housing, removal of neighborhood blight and ancillary job creation. Kreeger said he will appear before the Clean Ohio Commission on May 18 to discuss the two grant applications. "This is a very competitive process so representatives from the Grand Theater and the former nursing home can attend the hearing to discuss their projects," said Kreeger. "The grant applications will be updated and be available for the public to review at the main public library on South Fourth Street in Steubenville," Kreeger said. STEUBENVILLE - Scott Dressel had his eyes on the vacant building near the Grand Theater for months. Now Dressel and a two-man work crew are busy cleaning out the interior of the structure while a construction crew repairs the deteriorating roof. Dressel, chairman and president of the Grand Theater Restoration Project said he plans to remove the drywall and restore the original brick walls, "and I hope to bring a retail business in here." The building was owned by Derek and Lisa Ferguson who donated the property to the theater project. "We originally owned the theater and had used the buildings for storage. We had donated the theater to Bishop Al Fenner some time ago who later donated the building to Scott for his restoration campaign. We no longer needed this storefront building and felt it was time to donate it to the theater organization," explained Derek Ferguson. "At one time the building was home to Barclay's Finance and later a bridal shop. We are happy to donate the building to the Grand Theater group," added Lisa Ferguson. According to Dressel, a new vinyl roof is replacing the existing building roof. "The nice thing about the building is it's attached to the theater buildings. There is an elevator in the building that was once used for access to the theater second floor area. We have to have an inspector look at the elevator but if it can be repaired it will save us the trouble of installing a new elevator," noted Dressel. He added heat has now been restored to the theater offices, lobby and museum. "We had gas heaters donated and Columbia Gas has recently installed the gas lines. The lobby painting has been completed, the original mirrors have been put back on the walls and we hope to have the new carpeting put down within the next couple of weeks. That will allow us to hold events in the lobby and visitors will be able to look through the glass interior doors to watch work progress in the lobby," explained Dressel. "Our goal is to finish the lobby, theater office and the museum this year. That will allow us to host events in the lobby and to put donated items from the Steubenville theaters on display in the museum. And if I can find a business person interested in leasing space in the donated building it will bring some retail back to this block and give us a funding source for our restoration efforts," stated Dressel. "We still have a lot of work to do. Years of work. But we are making progress. And once we complete our projects for this year people will be able to see the glory of the past and glimpse what the future holds for the downtown," Dressel said. "We continue to seek donations and apply for grants to help us complete the Grand Theater project. There is still a lot of interest in restoring the theater. I am already planning a Christmas party for this December that will be held in the theater lobby," said Dressel. Copyright 2012 The Herald-Star. All rights reserved. This material may not be published, broadcast, rewritten or redistributed. Organizers of the first celebrity art auction to benefit the Grand Theater Restoration Project are calling the fundraiser "hugely successful." The Grand Theater Restoration Project committee joined forces with Hamilton Fine Art & Auctions for the event on Dec. 1 that featured about 150 works - "fine art originals and limited editions from Disney to Dali." It was held at the Fort Steuben Ballroom, a place that was interesting to go to and what seemed like a perfect venue for such an event. Billy Petrella and Francesca Carinci were co-chairs for the fundraiser, serving on a committee that also included Scott Dressel, Jan Glaub Rainbolt, Donna Keagler, Ed Stanislaw, Tony Corella and Patricia Fletcher. Carinci reported that there were about 100 people attending with 70 registered as bidders for the auction conducted by Janice Hamilton, who is the owner of Hamilton Fine Art & Auctions and who was a successful actress in stage, film and television. She had recurring roles on "As The World Turns" and "All My Children." I find it's always a pleasure to meet another Janice, considering there seem to be so few of us. Carinci loved one painting in particular. "The Renoir captivated me from the minute I saw it, and I could not stop looking at it - the gilded copper frame, the shadows and the 1918 ambiance. 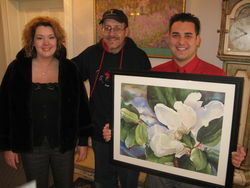 I went home with it, and it makes me smile every time I look at it," Carinci said. 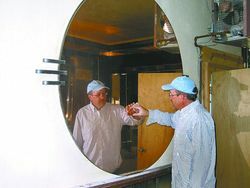 Jon Cooper donated "a fabulous hand-carved, beveled glass mirror. He painstakingly carved the piece, used old-world carving techniques learned from his wife's grandfather, who was a local cabinet maker," according to Carinci who said Jody and Carolyn Glaub won the mirror and were very pleased with it. "It was a 'Grand' time," she said of the event. Sponsors included Apex Environmental, Walmart Distribution Center 7017, the Center of Music and Art, Froggy 103.5, the Herald-Star, WTOV9, the law office of Francesca Carinci, Fort Steuben Apartments, Village Sleep Center, Rehab Plus and Tri-State Financial Service, according to the program book. Among the photos you'll see on this page are Charlie Hick and his wife, Holly, who looked really sharp in their dress-up attire. The couple marked their ninth anniversary on Nov. 30, the day before the auction, so they were continuing their celebration. And check out the photo of Roberta McHugh with Madeline and Ed Stanislaw. That is indeed Roberta on the left. I hereby publicly apologize to Roberta, who I misidentified in a photo taken earlier this year when the Jefferson County Red Cross Chapter had its Girls Night Out fundraiser. I didn't know that until the auction. Sorry, Roberta. The art auction raised almost $9,000, according to Carinci, and I understand that the gasline and heat work at the theater possibly will be done before Christmas. So things are moving along in "grand" fashion. The Grand Theater Restoration Project committee is joining forces with Hamilton Fine Art & Auctions to present a celebrity art auction at the Fort Steuben Ballroom, located at 180 N. Fourth St., Steubenville. It will be held Dec. 1 with the preview beginning at 5 p.m. and the auction itself getting under way at 6:30 p.m. The cost is a $25 donation for the cocktail attire event with a complimentary wine tasting and hors d'oeuvres. Tickets can be obtained in advance by calling (740) 264-4466 and also will be available at the door. They also are on sale at the Center of Music and Art in Wintersville and Frank & Jerry's and Two Brothers Dry Cleaners, both in Steubenville. The event will feature 175 pieces, according to committee member Billy Petrella. There will be oils, watercolors, serigraphs, lithographs, mixed media and prints. All artwork is custom framed. Artists may include Harrison, Schluss, Miro, Max, Ebgi, Sabzi, Treby, Blank, Haney, Erte, Dali, Picasso, Neiman, Britto, Chagall, Raad, Tarkay, Deleuze, Benfield, Kupesic, Capen, Sacasas, Anagnostis, Disney Cells and more, according to an event flyer. It bills the event as something featuring "fine art originals and limited editions from Disney to Dali." And that's in addition to sports memorabilia - for Steelers' fans, there will be an autographed Jerome Bettis jersey - glass, sculpture and fine jewelry. "There's literally something for everyone in every price range," said Petrella, who is event co-chair along with Francesca Carinci. The planners also include Scott Dressel, Donna Keagler and Jan Glaub Rainbolt. There also will be four faux furs up for auction. They're in pristine shape and originally came from two downtown businesses no more: Denmark's and Cooper and Kline's. The auction will be conducted by Janice Hamilton who is the owner of Hamilton Fine Art & Auctions, not to mention a successful actress in stage, film and television who among other things had recurring roles in the television soap operas - "As The World Turns" and "All My Children." Those of you planning to attend can park your vehicles at one of two locations - the Steubenville Post Office in the front or back lot and the parking lot at Tri-State Financial Services at 255 N. Third St. There will be an attendant at both locations, and both spots will offer shuttle service back and forth to the hotel, so don't let parking be an issue that might keep you away, organizers say. "Whether you like art or not," said Dressel, president of the Grand Theater Restoration Project committee, "it's going to be a nice event." The Committee for the Restoration of the Grand Theater combined fashion, furs and food to raise more than $5,000 toward its ongoing effort to give new life to a downtown fixture many may have thought was destined for doom. "A Grand Night of Fashion" was held Nov. 5 for a standing-room-only crowd at the Center of Music and Art in Wintersville - facilities courtesy of Jody and Carolyn Glaub - and featuring men's, women's and children's outfits from Macy's, both dressy and casual. Macy's sales managers Carrie Porter and Julie Woodbury were on hand to make the show a success with three of the store's Clinique and Estee Lauder makeup artists available to make everyone sparkle. They were Chrissy Speedy, Ashlie Black and Lorianne Barbour. Francesca Carinci, one of the restoration project's biggest cheerleaders, looked smashing in her red dress and silver heels as she introduced all the models, yours truly included who was ordered to be the first one out on the runway. All the better to snap some photos, my little pretties. And by the way, I liked my outfit so much, Better Half bought it for me as an early Christmas present. He just doesn't know it yet. Other models were Emily Canella; Jennifer Cesta; Cathy Davison and her son John; Nina Dutton; Dave Elias; Patricia Fletcher; Sarah, Tom, Tony, Nolen and Julia Gentile; Claudia Holmes; Dr. John Irvin Sr.; Nate, Noah, Rachel and Shannon Irvin; Betty Kessler; John Mascio; Laura Meeks (one of two women Better Half whistled at on the runway - yes, the other one was me); Shay and Quinn McCoy; Michelle Miller; Meredith Rohan; Billie Petrella; Mike Petrella; Joyce Ryan Orlando; Doug Potts; Margie Radakovich; Kay Sedgmer; Ame Taggart; Ronda Teramana; Ramaine Turrentine; Nan Watzman; Marie Wilson; Cindy Yanez; and Nikki Zimnox. Carrie Porter gave a description of all the outfits to an attentive audience that afterwards enjoyed an array of wine, hors d'oeuvres and holiday pastries. Students from the Franciscan University of Steubenville helped as hosts and hostesses. The evening began with a "Happy Birthday" wish to Francesca's mother Mary Carinci and cute commentary from the Rev. Richard Davis, who noted his wardrobe isn't exclusively limited to his black robe. There's the white one, too, but only for May through September, he joked. After the style show came an auction conducted by Dale Featheringham with assistance from Donna Keagler, another staunch restore-the-Grand person who called the event a huge success. Up for grabs were several donated vintage furs - all quite lovely - and a trip to Aruba. Door prizes were furs as well, which Scott Dressel held as he stood next to me. Karen Jarrett, who said she never wins anything, went home with one of them. Behind the scenes as we "models" awaited our runway time, I met Doug Potts of Bellaire, a retired librarian who told me he was an usher at the Grand Theater from 1969-70 when one of the big movies of the day was "Butch Cassidy and the Sundance Kid." He was a junior at Stanton High School in the Edison school district then, graduating in 1971. Turns out his sister Darlene Potts was friends with my sister, Cathy Hout, during their Class of 1966 Jefferson Union High School days. Small world. Later in the evening, I was approached by John Cooper, who told me he graduated with my sister Cathy. John's sister-in-law is Francesca Carinci. The world is shrinking. So it was a great evening. Hats off to Macy's, the committee and all who made this possible. Next up on the fundraising calendar for the Grand Theater is an art auction and holiday gift sale on Dec. 1 from 6:30 p.m. to 9:30 p.m. at the Fort Steuben Hotel Ballroom at 180 N. Fourth St., Steubenville. Preview time begins at 5 p.m. There will be fine art from Disney to Dali, sports memorabilia, jewelry and many other items. Celebrity actress Janice Hamilton will conduct the auction, and there will be valet parking, according to a post on Facebook. Wine and holiday treats will be served. Tickets are $25 per person and are available at Frank and Jerry's and Two Brothers Dry Cleaners as well as other locations to be posted. If you'd like to be a "Friend of the Grand," annual tax-deductible memberships are available. They're $25 for an individual; $50 for a family; $100 for a business with less than 50 employees; and a corporate membership of $1,000 applies to more than 50 employees. Members receive invitations to special-members-only events and other specials as determined. Contact any board member to join or call (740) 632-2899 for information. STEUBENVILLE - The plaster is still flaking from the walls and ornate artwork in the Grand Theater. But the 86-year old theater that has sat empty for decades is starting to live again. The lobby has been painted, workers are preparing to install a heating system, and new carpeting is ready to be installed on the lobby floor. U.S. Rep. Bill Johnson, R-Marietta, took a personal tour of the theater Friday morning and walked away encouraged. "This is another example of the beginning wave of prosperity for eastern and southeastern Ohio. The projections are of 10,000 new jobs here in the area for the next three years," Johnson said as he walked through the theater. "According to the recent ABC World News report anyone who wants a job can have a job in Steubenville. That is exciting. We have an opportunity coming our way because of the Marcellus and Utica shale drilling industry," said Johnson. "We now have to keep the federal regulators off the backs of the companies taking advantage of what God has given us. And we have to make sure these companies are hiring Ohio workers for these long-term jobs," Johnson added. He was at the theater to pick up a Dave Barnhouse print he had purchased earlier this year at a fundraising auction for the Grand Theater restoration campaign. "I have performed in community theater. Back in 2006 I played a part in the play "Inherit the Wind" in a community theater. This would make a great community theater, and I will be here when the doors open for an audience," he said. "I personally donated to the restoration and my campaign has donated to the campaign," remarked Johnson. 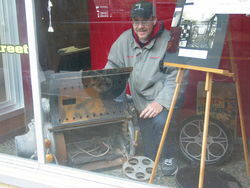 Local businessman Bob Becker also stopped by the theater to donate several art-deco pieces. "I came here as a kid probably 60 years ago. I always thought the Grand put all of the other theaters to shame. It was elegant in the true Biggio fashion. The restoration of the lobby is putting it back to the way it once looked," Becker commented. "The Grand Theater committee is tackling a big project and it will take a long time. But this theater has potential. You can walk into the theater and still visualize what it once was and see what it can be again," stated Becker. "With the new building materials now available the restoration work should actually be easier. This was once the place to go in Steubenville. I'm looking forward to seeing the finished project," said Becker. Scott Dressel, chairman of the board of directors for the theater, has said he expects the complete renovation of the 86-year-old theater to take approximately 10 years. "But we hope to have the lobby finished by this winter that will allow us to hold fundraising events there and to bring back a glimpse of the grandeur of the theater from past years," said Dressel. STEUBENVILLE - Chris Bomely never saw a movie in the Grand Theater. Bomely is too young to remember when the downtown business district was home to five theaters. But the Steubenville native spent six hours Saturday with other volunteers cleaning debris from the theater and is planning on returning this weekend for a final cleanup day. "I wasn't around when this theater was open. But I want to do something to help my community and I would like to see what it looks like after it has been restored to its original condition," said Bomely. Bomely and Kyle Stutzman were assigned the task of cleaning out several dressing rooms located at the back of the theater stage. "There are six dressing rooms located up there. Plaster is falling from the ceiling and walls, so we are picking it up and putting it in buckets. Then we carry the buckets outside and dump it into a Dumpster," noted Bomely. "Some of those rooms are tiny. Its hard to imagine actors or performers running up that iron stairway and changing costumes in those rooms. But I guess at one time they did," added Stutzman. The final Saturday cleanup in October is set for 9 a.m. Saturday at the Grand Theater. Scott Dressel, chairman of the Grand Theater board of directors, said Saturday's volunteers will focus on the main seating area in the theater and the balcony. "I started this project in April last year after we persuaded the city we could save this building. Our first volunteer cleanup was in March this year when we took out 104,000 pounds of trash and debris. A second cleanup campaign took out another 100,000 pounds. So we are now basically cleaning up the remainder of the debris," related Dressel. He added he is close to completing the painting of the lobby walls but is waiting for more work before applying a third coat of dark blue paint. "Thank goodness we received a furnace from TEAM Automotive. We will place that in our office next to the lobby and I can always open the door to the lobby to allow some heat into that area. I am hoping we can get one more furnace donated for the museum that will be located in the store to the south of the lobby," Dressel said. "The six main lobby doors are in the process of being refinished and that will included replating the hinges, door closers and handles. When the doors are done and holes are cut into the lobby floor to allow us to run heating ductwork we will paint the walls again and put down new carpeting in the lobby hopefully by late November," continued Dressel. "At that point every surface in the lobby will have been cleaned, polished and restored. After that I will take a break. Although I also want to help install new lighting that has been donated to our poster frame boxes," added Dressel. Linda Hilty and Jeff Wargo were helping three students from Franciscan University of Steubenville clean out the projectionist booth Saturday afternoon. "Why do we come here for this? We ask ourselves that question every time we are here. But I view this as kind of a project to restore old Steubenville. "It is much better in here since the roof was sealed up. It is drier and smells better," said Hilty. "When I agreed to volunteer today I had no idea the building was this bad. I guess I thought it was just a matter of some peeling paint. But after spending time in here I can see this theater was really nice at one time. I can imagine what it will look like once everything is cleaned up and restored," observed Tim Michaud, a senior at the university. Michaud and Sean Blouin volunteered for the clean-up day at the urging of classmate Chris Kotur, who is a Steubenville native. "I want to help out my hometown. My vision is to have the downtown area rejuvenated and I think this is a good start. You can already see other businesses doing their part," said Kostur. And Dawn Tony Leone spent her Saturday at the theater because her friend Francesca Carinci asked for help. "Fran has been my friend and my inspiration for the past 15 years. I came here at her request. But I also enjoy helping out and making a difference here," stated Leone. Dressel has said he expects the complete renovation of the 86-year-old theater to take approximately 10 years. "But we hope to have the lobby finished by this winter and that will allow us to hold fundraising events there and to bring back a glimpse of the grandeur of the theater from past years," said Dressel. The next fundraiser set to benefit the theater restoration is a fashion show at 6:30 p.m. on Nov. 5 at the Center of Music and Art. "Local business women and celebrities will be our models and we will have a drawing for vintage furs from the Hub. A $25 donation will include admission to the 'Grand Night for Fashion' as well as wine and holiday goodies," said Dressel. "Right now we are continuing to seek funding through donations and grants. We hope to move on to several major projects at the theater in 2012," he said. STEUBENVILLE - The more Scott Dressel explores and cleans the Grand Theater and the adjacent store buildings, the more he discovers. 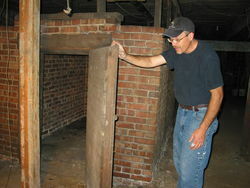 Dressel recently stepped down a steep flight of wooden steps into the basement of the store just south of the theater. He is planning to creat a mini-theater and downtown entertainment museum in the former store and wanted to see what was in the basement. "First of all there is a dirt floor and we found a number of meat hooks down here. But probably the most mysterious discovery so far has been a brick room in the middle of the basement. I thought it might have been used at one time to store illegal liquor during prohibition," related Dressel. "But when I opened the wooden door I found about 100 wooden spindles and wood frame windows that appear to have been built during the Victorian era judging from the design," said Dressel. "The brick room is about 8 feet long, 6 feet wide and 6 feet tall. The inside ceiling is arched and entirely of brick. I have made some calls but so far no one knows what the room might have been used for," explained Dressel. According to Sanborn maps, the building at 123 S. Fourth St. has been used as a saloon, restaurant and meat store at different times in the late 19th century and early 20th century. In later years the store was home to a men's clothing store. Dressel is hoping for more discoveries this month when he hold three cleanup weekends in the theater. "We will be working from 10 a.m. until 4 p.m. Saturday, Oct. 15 and Oct. 22 cleaning the main stage area, the dressing rooms, balcony, main floor and projection booth. Anyone who would like to donate some time toward the restoration of the Grand Theater will be welcome," declared Dressel. He has started to paint the theater lobby walls a dark blue that will reflect the original lobby colors. "We will be taking out the ground floor seats at some point and save the best seats for a mini-theater next door in the museum," said Dressel. "The former store is a fairly long room and I would like to put up a flat screen television in the back and create a mini theater. We will also have the museum in the front of the store so we are collecting memorabilia for display from the Grand as well as the other downtown theaters that are now gone," stated Dressel. "The rest of the ground floor seats will be offered for sale to anyone who wants a piece of the theater history," he added. "We still have a long way to go but we are making progress day by day. It is exciting to see the theater lobby start to look like it once did and always fun to discover these little mysteries in the buildings," said Dressel. STEUBENVILLE - Gary Brown hasn't been inside the Grand Theater since he was a kid joining his brothers to pay $2 to watch Bruce Lee in "Enter the Dragon" over and over. "It was great because you could stay all day. We just lived a few blocks from here. The ushers didn't make you leave after the first show. So we sat in the balcony and watched the same movie all day long," recalled Brown. He returned this week to a different looking theater to remove mold that has been created by years of rain water leaking into the building. 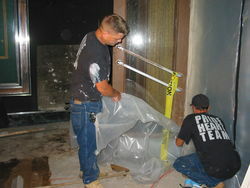 Brown and Apollo Pro Cleaning Field Manager Jerry Truex were taping plastic over the doorways leading to the theater so they could conduct mold remediation in the lobby and adjacent room that eventually will serve as the theater office. 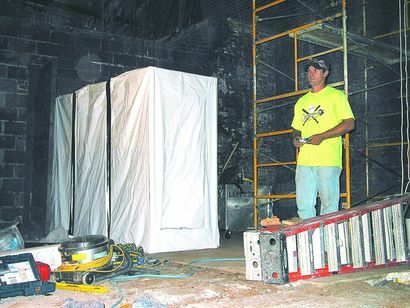 "The first step was to stop the water issues, which was done when the theater roof was covered and sealed last month. Our guys will be wearing ty-vex suits and respirators when they work in here cleaning out all of the contaminants. That's why we put up a yellow caution tape out front so no one comes in here," explained Chris Elliot, the operations manager for Apollo. "Our job this week is to remove the microbiological contaminants and that is what we will do. After that we will apply a sealant to the surface walls and ceiling and the theater and room next door will be ready for the next step," said Elliott. Elliot said the in-kind services donated to the Grand Theater Restoration campaign, "are valued at approximately $30,000." "This is probably a two-day job that we can wrap up by Friday afternoon," he noted. According to Scott Dressel, president of the Grand Theater board of directors, "Anthony Mougianis donated the mold removal services from Apollo Pro Cleaning and drywall for the lobby restoration has been donated by local contractor Jim Sarlo. "These in-kind services are very helpful and can be used to secure additional matching grants," said Dressel. "We plan to start painting in September when the humidity drops and it is a little cooler. Our goal is to have the lobby completed by late fall and we will then have the lobby lit at night so it looks like the theater is open again. The ornate scroll work next to the ceiling will be done in a bronze color and Terri English has volunteered to handle that detail painting," Dressel said. "Once the lobby is completed we can host small events in the lobby. We will probably take down the curtains on the doors that lead to the theater. That will allow visitors to see the theater as it is now and watch the restoration work over time. We may also want to finish at least one of the ballrooms so we can hold events there in the near future," said Dressel. "The glass poster frames and the mirrors in the lobby are still in good shape and would be very expensive to replace. So we will keep them in place," he added. We join the Friends of the Grand in sighing a bit of relief that a major step in the long climb toward restoration of the city of Steubenville's last great downtown movie theater has been taken. The roof project at the Grand, which finally stops further damage from wind, rain, snow and weather from advancing, has been completed. The Grand Theater represents an icon of hope for the future that can spark a new generation to have a reason to come downtown for entertainment, and the roof is a milestone. No, it's not a step indicating any shows will be held in the theater at anytime soon, but without completing a roof replacement, any future work would have been for naught. The 87-year-old building is just beginning down a long road, expected by project leaders to take as long as 10 years, toward restoration. Grants are beginning to join the private donations, including $5,000 from the J.C. Williams Charitable Trust to go toward the lobby paint and decor and renovating the theater offices next door. Drywall has been donated by local contractor Jim Sarlo and Anthony Mougianis has donated the services of his professional cleaning firm for mold removal. All are key steps in the physical renovation project, but equally important is a donation from DPS Penn, a land company for Chesapeake Energy, which will be used to establish an endowment fund. The fund is important because it can be used to match grants and donations in the future. Friends of the Grand is growing from a concept to a project. The endowment can mean it will become a spirited movement involving the whole community. STEUBENVILLE - It is quiet inside the Grand Theater these days. The sound of water dripping from leaks is gone now that Jason Zumbahlen and his crew from Blast Master of Effingham, Ill., have completed spraying a polyeurathene and sealant foam cover on the roof of the 87-year-old building. The complete silence is noted immediately by Scott Dressel and a visitor to the building that has survived the water leaks and is now being prepared for the next phase of a 10-year restoration project. "I know I am sleeping better at night and my blood pressure is down. And the theater gets a little drier every day. We no longer have that musty smell in the theater we had when it was always wet," said Dressel, president of the Grand Theater board of directors. 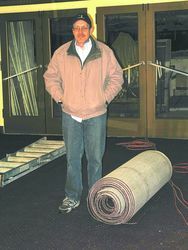 Two large rolls of carpeting, donated by Bill Croskey of Steubenville, are now stored in the theater lobby. Dressel said before the carpeting is installed, a complete mold eradication job donated by Apollo Cleaning of Wintersville will be done. That will be followed by the installation of drywall over the original walls and, finally, the painting of the lobby walls and ceiling in the original theater colors. "We received a $5,000 grant from the J. C. Williams Charitable Trust. That money will be used for the lobby painting and decor as well as renovating the theater office next door. The drywall for the lobby has been donated by Jim Sarlo, a local contractor, and Anthony Mougianis has donated the mold removal services from Apollo Cleaning. These in-kind services are very helpful and can be used to secure additional matching grants," explained Dressel. "We plan to start painting in September when the humidity drops and it is a little cooler. Our goal is to have the lobby completed by late fall, and we will then have the lobby lit at night so it looks like the theater is open again. The ornate scroll work next to the ceiling will be done in a bronze color. Terri English has volunteered to handle that detail painting," Dressel said. "Once the lobby is completed, we can host small events there. We will probably take down the curtains on the doors that lead to the theater. That will allow visitors to see the theater as it is now and watch the restoration work over time. We may also want to finish at least one of the ball rooms so we can hold events there in the near future," said Dressel..
Dressel also announced the restoration campaign has received a $5,000 grant from DPS Penn to establish a Friends of the Grand endowment fund. "Members will receive invitations to special members-only events and discounts on event tickets. To join the Friends of the Grand, interested persons should contact any board member or call (740) 632-2899 for information," Dressel said. "Only the earnings from the endowment fund will be spent on operating expenses. This kicks off a Friends of the Grand membership drive. Individual memberships will be $25 and a family membership is $50," Dressel said. "The purpose of the endowment is to create an investment fund, from which the interest and earnings can be used to cover operating costs like utilities and, eventually, staffing. The interest and earnings can also be used for improvements and maintenance. The principal donations are intended not to be used and to grow the endowment to a level that makes the Grand Theater self-sufficient. The endowment funds are invested to result in the best return available with no risk to the principal balance," explained Dressel. "We continue to focus on our fundraising efforts. But we are also planning clean-up weekends this fall. Since we will be working in the lobby, we will set up Dumpsters in the alley behind the theater and resume cleaning out the main theater, the ball rooms and the basement. There are marble panels and seats in the basement that we need to bring upstairs to inspect. And we have volunteers who want to get busy cleaning again," Dressel said. "The next phase of the restoration after the lobby will be on the front of the building. We are working with Steubenville architect Les Zapor to have a marquee designed that will look like the original theater marquee of 1925. We will have environmentally friendly LED lights in the marquee. It is an expensive project and we hope to receive donations for the construction and installation of the sign. And we will be looking at the windows that were painted over. We can either scrape and clean the original windows or replace them with historically correct windows. We will strip the front facade of the white paint, clean it and restore the front of the building to the original look," Dressel said. "I see a growing interest in restoring the Grand. You can see sprucing up going on all over the downtown area. North Fourth Street was once considered a pretty bad area, but look at it now. The downtown is looking better. There is a growing pride and interest in the downtown area. The Grand Theater will be part of that downtown restoration. It just takes a commitment and work," Dressel stated. STEUBENVILLE - It should stop raining inside the Grand Theater by this weekend. A three-man crew spraying a polyurethane foam and a sealant hope to have the 87-year-old roof completely covered and sealed by Friday. And that is welcome news for Scott Dressel, president of the Grand Theater board of directors. "I will be so glad when this roof is completely done. That will stop the water leaks into the theater and allow us to move forward with our cleanup and restoration work," said Dressel. Dressel stood on the tar roof watching Jason Zumbahlen, owner of Blast Master of Effingham, Ill., slowly spray the yellow foam onto the roof top. "It is similar to a rhino liner that is applied to truck beds. I was able to talk to the director of the Playhouse Square in Cleveland where the same material has been used on seven theaters there and it has stood up very well. 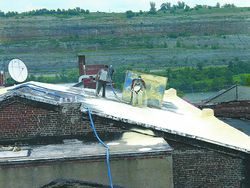 Once the foam is dried, they will apply a white sealant that will help protect the roof and serve as insulation," said Dressel. "We use an Energy Star-rated material that has been used on other buildings and been quite successful," noted Zumbahlen. Dressel and his volunteers have been seeking donations for months in order to repair the roof. Dressel said he made the journey through the theater lobby, up the steps to the projectionist booth and climbed the iron ladder to the roof, "at least 20 times today. But people have donated money to this project and I just want to make sure their money is invested properly," said Dressel. "I am still looking at about 10 years to have the theater completely restored. But we are taking this in stages. We will restore the lobby where we can hold events and the two front rooms facing South Fourth Street. The theater will take a lot of work, but we can make this happen," Dressel said. "We will be stripping the front facade of the paint, then cleaning it and restoring the facade. All trim and windows will be restored and sealed to the weather. A new marquee will be designed that will incorporate the 1920s original vertical "GRAND" and the 1950s horizontal signboard portion of the marquee across the entire front of the building," noted Dressel. "It is a lot of work but we are seeing more support for the project. People aren't asking why we are doing this. Now they want to know when the theater will be open again," concluded Dressel. "I still have a vision of what this theater can be. Once the roof is sealed we can continue our work," Dressel said. STEUBENVILLE - The Grand Theater Restoration Project has been awarded a $30,000 grant from the Ohio Governor's Office of Appalachia allowing the repair of the building roof to start this week. Scott Dressel, president of the project board of directors, said Tuesday the Delagrange Construction Co. of Carrollton started the repair of the building roof on Monday. "They were the only contractor to give us a bid on the roof, gutter and downspouts, roof coping and covering the skylight. "They will be spraying the entire roof with polyurethane foam that will give us an R-15 insulation rating. That will not only stop the leaks but give us insulation that will keep the heat out in the summer and the heat in during the winter months," Dressel explained. "We talked to several contractors but we were asking for people interested in rehabilitation work. "That can be irritating work because there is a need to pay attention to the little details. The Delagrange Construction people suggested different alternatives and were flexible enough to find the material we needed for the project," added Dressel. "I was convinced we needed to go with the polyurethane roofing material after talking to the maintenance manager at Playhouse Square in Cleveland. They have used the same type of material on their buildings since the 1970s and are very pleased with the results," Dressel added. Dressel estimated the roof work will be completed by late May. "We originally planned on just repairing the theater section of the roof. But the state grant will allow us to complete the entire roof. The contractor will also be spraying both sides of the building down to the adjoining building roofs so the theater will finally be secured and dry," he said. "State Rep. Lou Gentile, D-Steubenville, put us in contact with the Governor's Office of Appalachia. And Wanda Hairston from the GOA helped us tremendously throughout the application process. "We were fortunate to receive $30,000, which is the largest grant amounted awarded by the office," remarked Dressel. "We also plan on replacing the current electrical system with temporary service that will allow us to start setting up our office on one side of the theater and the museum on the other side of the lobby. There were several theaters in Steubenville and we hope to create a display of that history in our museum. "Once the roof and electric work is done we will shift to the building's front facade and marquee. And we hope to get heat installed before next winter although that will require an additional donations," Dressel stated. "I have been working on this project since April 2010 and I believe in it now more than ever. Once the roof is completed the building will be dry and we will have time to start working on the interior," Dressel said. Dressel said the restoration project has so far received 132 donations from individuals and businesses. "Once the roof is done, I will be setting those names aside in a special category of those who helped save the Grand by putting on our roof. These were the people who believed in the project from the beginning," Dressel said. "Theater restoration work takes time. We would like to have this project completed in six years but that will depend on money and the time to do the work. I have noticed a change in public opinion. When we started this project a year ago people were asking why we were doing it. Now people ask when we will be ready to open the theater," noted Dressel. "Getting the roof done is a major accomplishment. Every time it rains it causes me anxiety. It will be nice to see the building dry and secure," said Dressel. WINTERSVILLE - Today marks the conclusion of Ed Looman's second year as executive director of the Progress Alliance public-private economic development organization for Jefferson County. After hearing a report on the organization gaining one private trustee a month this year, at $2,000 per trustee business, Looman gave thanks during Tuesday's Community Improvement Corp. meeting to the private trustees and the governments that provide money to operate the economic development and marketing programs of Progress Alliance. "The support we receive is nothing short of amazing, particularly given the economic times we are facing," he said. "I know it's tough to cut that check." The CIC trustees, who oversee the work of Progress Alliance, held their May meeting at the American Red Cross Jefferson County Chapter offices on Talbott Drive. Looman's two-year report noted work Progress Alliance has done in providing assistance that led to the expansion of Wildfire Motors and the purchase of the Jefferson County Chamber of Commerce building by Capital Recovery Systems, which also added more jobs at its Steubenville location. The Power of 32 Pittsburgh economic regional effort. The 3-2-1 Jobs (three counties, two states, one goal - to build a better economic future for Jefferson, Brooke and Hancock counties) initiative, which is being spearheaded by assistance from the Voinovich School at Ohio University through an Economic Development Authority grant. Work to create a Jefferson County Port Authority and folding it into Progress Alliance. Involvement with the MCBI Muskingum business incubator and the Big Idea entrepreneur contest. Work with EM-Media on the Be Jefferson County Proud advertising campaign. The successful launch of the Best of Jefferson County annual awards event and banquet. Increasing ties with state economic development officials. Regional involvement, including Looman's service as co-chair of the Columbus-to-Pittsburgh Corridor highway committee, serving as a founding member of the Jefferson-Belmont-Monroe economic development partnership and work with the Downtown Weirton Civic and Business Association to hold annual Regional Economic Outlook forums. Continued data gathering and development of a database of available commercial and industrial properties in the county. There were a number of other items on Looman's report, but he spent time talking about the property listing. Looman said the state is changing its system for the listings and the next staff addition at Progress Alliance will be spending time this summer updating the listings. Interviews for the hub coordinator position, who will work on small business development and relations with the MCBI group among other duties, are being conducted now. Looman said the listings already on hand helped Jefferson County stay in the running for a potential 300-job, $100 million project. "We are in the hunt for a huge opportunity that the Ohio Department of Development brought to us," Looman said. "The initial site we suggested was rejected. The site selectors found two more sites on our website. If they had not been listed, we would be totally shut out. We may not win it, but we are in the game because the inventory is there." Looman and CIC President Ken Perkins said a meeting is being held soon with representatives of the Steubenville Area Board of Realtors on better coordination between the groups. Perkins said often, there are properties for sale that Progress Alliance could market, but it's not aware of their availability. Heard an update from Scott Dressel on the work to form the Steubenville Historic Landmarks Foundation as a non-profit group to raise funds and manage the project to restore the Grand Theater, the last remaining downtown theater building. Dressel said it was recently determined a repair to the roof to make the building weather-tight will be about $120,000, not $300,000 as initially believed. He said once money is raised and the roof is sealed off, the renaming interior work can progress over time because the building no longer will be exposed to the elements. Dressel said he will have details soon on where citizens will be able to cast votes in hopes of the Grand project landing a $250,000 grant from Pepsi. Heard from Kathy Musso, Red Cross chapter director, and Kyle Brown, chapter president, about the work of the chapter. Brown noted locally raised funds are important to the chapter because without the local Red Cross, service would have to come from Canton. Musso said in addition to disasters, the local chapter responds with assistance to an average of 30 fires that impact families each year. Heard Perkins report that the CIC is on pace to continue adding one trustee a month for the first six months of the year. The goal is to add a total of 12 trustees during 2010. Heard Looman's update on the scheduled Aug. 6 Bridge Invitational Golf Tournament, to be held at the Steubenville Country Club as a fundraiser for Progress Alliance's marketing efforts for the county. The tournament has been changed from a marketing effort to a corporate challenge and will feature a traveling trophy to the winning business team. Apex Environmental is a title sponsor and the Herald-Star is a presenting sponsor. Two more title sponsors are needed and there is room for as many presenting sponsors as want to sign on, Looman said. 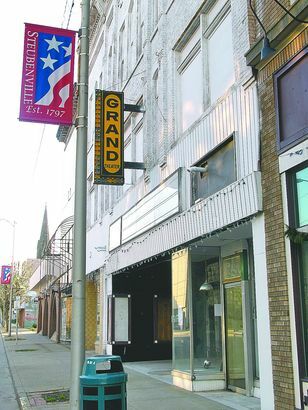 STEUBENVILLE - Organizers of the "Save the Grand Theater" campaign are asking for a share of the city's Community Development Block Grant funds to assist restoration efforts at the South Fourth Street building. Scott Dressel, who also serves as chairperson of the city's Historic Landmarks Commission, on Thursday made the formal request for $100,000 a year for a total of $500,000 to City Manager Cathy Davison and Urban Projects Director Chris Petrossi. "Also we will be applying for a number of grants, some of which may require matching dollars from local government and individuals. I realize it's a big request, but it's a big project. A $100,000 match would probably ensure that we get the roof done this year and then move on to other items as funding grows," Dressel told city officials. Petrossi said his office is currently preparing a draft of the city's new five-year consolidated plan for 2010-14 as well as the fiscal year 2010 one-year action plan. "The city has been notified the FY 2010 CDBG allocation will be $809,394. We are always open to comments on the 2010 plan and are preparing a draft plan to present to the planning and zoning commission at their June 7 meeting," said Petrossi. Dressel updated the Historic Landmarks Commission members on efforts to save the theater that has been closed since 1979, and predicted restoration efforts will cost from $4 to $5 million. "Bishop Al Fenner owns the building but he has agreed to donate the theater to the Steubenville Historic Landmarks Foundation. We now have an attorney, Francesca Carinci, who has agreed to help create a nonprofit status organization for us and once that is completed we will be opening an account for donations for the restoration campaign at JPMorgan Chase Bank," explained Dressel. "We have James Ludwig, an area architect who will be doing some renderings of what the theater will look like once it is restored. And we have a lot of volunteers from Boy Scouts to people in their 70s who want to help with the restoration work. 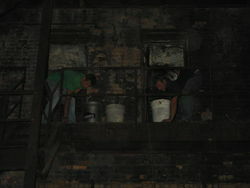 I have also heard from a group of retired Wheeling-Pittsburgh Steel electricians who want to help rewire the theater. We have a lot of talented retires in the Ohio Valley who are willing to help with this project," he noted. 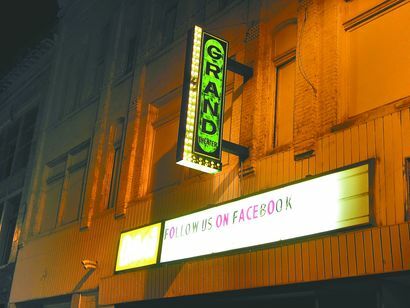 "We also have 450 fans on the Grand Theater Facebook page, and I have created a website called www.historicsteubenville.org dedicated to the Grand's restoration campaign," said Dressel. He noted he is obtaining bids to have the theater roof refurbished. "One of the storefronts next to the theater will be used as a museum for the performers who used to visit the city's theaters in past years. We are considering removing the storefront on the other side of the theater entrance in order to put a staircase in to the second floor and restrooms on the main floor," Dressel said. "The inside of the theater is pretty much of a mess but it is still very elegant. The lobby is pretty much untouched. A friend and I went up on the roof to cover the open skylight above the stage so that will stop rain and snow from falling onto the stage," added Dressel. "We also plan to replace the marquee. And Dave Barnhouse has given us permission to use his latest downtown Steubenville painting to create the original marquee," noted Dressel. "This work may take the rest of my life but I am pretty sure we can do this campaign. And it will revolutionize downtown Steubenville. I have heard a comment about the lack of parking for the theater. I can only hope we become so big that we have to worry about parking problems. When this is done it will be the most important impact in the downtown since the Grand was originally built. Restoration of the Grand Theater will have massive and positive economic repercussions for this community," commented Dressel. Great things are happening in downtown Steubenville. There is a wonderful resurgence of attitude, commitment and investment taking place by building owners, business owners and entrepreneurs from Steubenville and from outside the area. A can-do attitude has taken a firm hold on the historic downtown business district. During the past six months, a variety of new and unique businesses have opened their doors in the downtown business district. Some of them are already contemplating expansion. In addition to the variety of businesses already opened, there are eight additional storefronts currently under development with specific announcements of tenants coming during the next couple of months. The group that originally started the push for revitalization of the downtown area is the Steubenville Revitalization Group. This group was originally started by a small, but determined, group of downtown business people and a handful of other hardworking folks who care deeply about the downtown community. After organizing a core group and agreeing on a mission in its first year, the group decided to take the step to take its goals of revitalizing the historic downtown district to the next level. The SRG made the decision to retain Valley Ventures to develop a comprehensive and implementable (key word) plan to restore and revitalize the core 12-block focus area of the historic downtown during a 36-month period. This plan was developed last summer, and introduced to the full SRG membership and the general public in late September. Since that time, much positive energy and activity has been regularly occurring throughout the downtown. Just last week, as a result of all this positive energy, a new group has been formed to focus on saving and restoring the Grand Theater on South Fourth Street. The restoration of the Grand Theater will enable live plays, concerts, recitals, movies and other performing arts to be available once again in our historic downtown. As always there were (and still are) some naysayers doubting whether revitalization of the downtown is possible. My answer to them is always that everything is impossible until somebody does it. I tell the doubters they can choose to dismiss what we say will be happening, but to watch closely for the ongoing business openings, successes and developments that are actually occurring. As outlined in the master plan, downtown Steubenville is beginning to take shape as a lifestyle center. A lifestyle center is a pedestrian-friendly center where citizens will now have the opportunity to work, shop in unique stores, dine at quaint eateries, take in entertainment and cultural events and live downtown again in trendy, loft apartments. This is not some theoretical plan for some future time, but is representative of what is currently occurring throughout the downtown area. Unlike many cities, historic Steubenville is very fortunate to have retained a significant infrastructure of grand, historic buildings which many cities can only dream of having available for redevelopment. While pessimists may look at vacant buildings as problems, optimists, such as myself, see them as wonderful opportunities. The many fine businesses that have been located downtown for many years are now being joined by new businesses and entrepreneurs. In the coming months more new businesses and facilities will be joining in to provide additional retail, restaurants, fine arts galleries, museums, entertainment facilities, professional offices and loft apartment living. It is important to note that all of this is happening through private development and investment, not through government funding. People should not look to the government to create jobs or develop businesses. Government's role is to efficiently operate the important city services for its residents and to create a climate of cooperation by working closely with building owners, business owners, entrepreneurs and investors to facilitate the significant ongoing and future investment that will be taking place throughout the downtown. In my discussions and interactions during the past couple months with the new city manager and other city personnel, I have been very pleased with their positive attitudes in cooperating and working closely with the private sector development that is taking place by businesses, building owners, contractors and developers. This spirit of cooperation is essential to stimulate and continue this exciting revitalization of Steubenville's downtown. If you currently own a business in the region or are thinking of starting a business, I invite you to come and join the ever growing family of businesses that are seeing the unique opportunities that are available in historic downtown Steubenville. You can contact me at Valley Ventures Inc. at (304) 748-1525 or e-mail me at loustein@valleyventures.org to discuss this business opportunity in greater detail. We can assist with financing, business planning and marketing to expand or start your new business in the downtown area. The discussions are strictly confidential. I look forward to hearing and working with any and all business owners and entrepreneurs to help share our vision. The Capitol. The Rex. The Olympic. The Paramount. Ask Steubenville residents of a certain age about watching the movies in their younger days and they'll recite a litany of places that are gone. The last theater downtown that is standing is the Grand Theater, and it's a shadow of its former self. But it can be saved with some support and the same kind of dedicated effort that has led to a resurgence of small business in the downtown central business district. The Grand project is indeed just that. Grand. One local contractor estimates the full restoration of the building would take as much as $5 million. That's big money. But it's a big idea that could help feed a downtown renaissance. A Web search of the words "theater restoration" brings a lengthy list from across the nation of efforts to preserve, as community-based efforts, the theaters that once were the focal points of entertainment for generations. One of the points during the recent Smart Communities seminar was that literally every community that has undertaken such a project meets with success. However, to achieve dreams takes a healthy dose of reality, and reality in this case is money. But it shouldn't stop the dream but spur it on. Fundraising efforts have to extend beyond the city and its environs to reach out to Hollywood. Steubenville has Dean Martin among its favorite sons, and the late singer/actor/comedian had many friends and fans among the Hollywood elite, many still active today. We hope the efforts of local citizens to try to reach out to that community with the concept of a lasting memorial to Martin in his hometown find open ears, open hearts and a few open checkbooks. To the world of Hollywood, the Grand Theater is something small and far away, but to the city and its residents, it can once again be a very large part of the future, honoring the past. We laud the efforts of the citizens who are getting behind the project, hope they can preserve the building now to allow it to be restored over a longer period and see the Grand as a rallying point for community spirit and civic pride.